Porretto Beach our Absolute Favorite! Attentive Service and Lots of Fun. Porretto Beach, The Porretto Family Makes your Visit a True Beach Getaway! Porretto Beach host events days and nights. Have you been to a beach bonfire lately? Do you want to? What is so cool here? The Porretto Family for the great setting and service. The nice groups of people that are attracted here. You will find grandparents with grand kids. Newlyweds. Families with kids of all age’s. Infants, toddler to teens. And there are singles too. It’s like a snap shot of life. Or one heck of a family get together! Very refreshing. Very relaxing. Very nice. With family and adult oriented events, it’s the perfect environment. If your new to this beach you will feel at home. If your returning, you are home! Hey, you can bring your own grill. Barbeque on the beach! Just look after the hot coals:) You can bring beer too! What a cool place! Is that down home enough? And with the mix of responsible people the situation is never unsettling. It’s just a great environment for everyone! Parking usually puts you close to where you set up. If you are carrying a lot it won’t be a hassle. Parking is $7.00. If you leave and return, present your ticket. Then you won't need pay again! Wow! Talk about customer oriented! July 2: The KuhunaKup - an invasion of dozens of catamarans. Watch the Cats race along the shores. Colorful and exhilarating. Then they make there Porretto Beach landing. Look out! July 4: Sand Castle building and the Biggest of American Holidays! July 10: Sand Man 5K Beach challenge. July 30: Spring Break Music Unity Festival. September 5: Labor Day Music festival. Talk about customer service read this. Attendants can even provide a list of restaurants that deliver to you on the beach! The Porretto Family offers venues and unique services. From Black tie and red carpet to beach casual! Good luck finding all that anywhere else. Create the perfect memory from a marriage ceremony, to reception, family reunion or corporate event. The Porretto Family can also provide catering services to fill your needs! Wow! 10th. St. & Seawall Blvd. 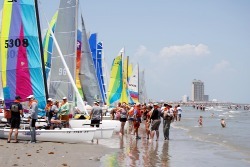 Leave Porretto Beach and return to Galveston Travel and Charm Homepage.